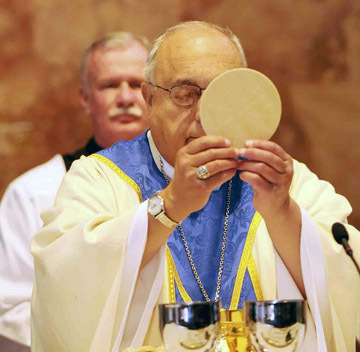 Bishop Joseph A. Galante celebrates Mass. Below, clergy process into church during the Camden Diocese’s Conference on Hispanic Catholic Charismatic Renewal on Sunday, June 26, at Divine Mercy Parish in Vineland. 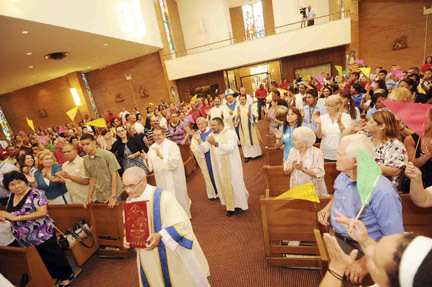 The Camden Diocese’s Conference on Hispanic Catholic Charismatic Renewal took place on Saturday, June 25, and Sunday, June 26, at Divine Mercy Parish in Vineland, bringing together more than 500 Hispanics from all over the diocese for leadership formation, praise and worship, and liturgy. The event was organized by Hispanic Catholic Charismatic leaders from the parishes of St. Anthony of Padua, Camden; St. Joseph Pro-Cathedral, Camden; Parish of the Cathedral of the Immaculate Conception, Camden; St. Josephine Bakhita, Camden; St. Joseph, Somers Point; St. Damien, Ocean City; St. Gianna Beretta Molla, Northfield; Divine Mercy, Vineland; Our Lady of Guadalupe, Lindenwold; St. Brigit, Glassboro; and Our Lady Star of the Sea, Atlantic City. Martha Reyes, singer and preacher from California, led presentations on healing, in addition to leading praise and worship concerts. On Saturday night, Father Ariel Hernandez, pastor of Holy Cross Parish in Bridgeton, engaged the faithful in Eucharistic adoration. On Sunday morning, Father Fabio Fernandez, parochial vicar of St. Bridget, Glassboro, celebrated Holy Hour; in the afternoon, Father Rene Canales, parochial vicar of St. Gabriel the Archangel, Carneys Point, spoke on the effect of Jesus’ healing power in bringing people closer to him. 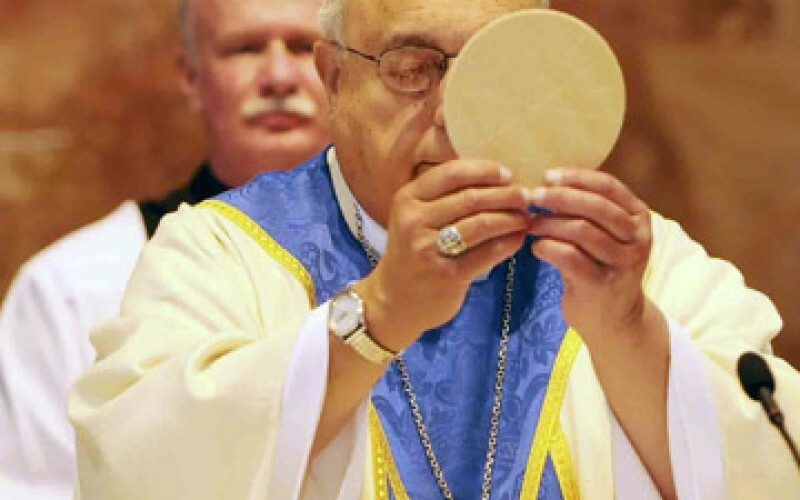 Presiding at Sunday’s Mass was Bishop Joseph A. Galante. “It was a great blessing to see so many people worshiping God together,” noted Kathia Arango, coordinator of the diocese’s Hispanic Catholic Charismatic Renewal. “It was wonderful to experience the love and commitment from the leaders of the Hispanic charismatic prayer groups from the entire diocese. I could see the happiness of bishop celebrating the Mass, with the Hispanic charismatic community,” she said.